I was curious what people generaly prefer, so I made this Poll. Please be honest with your choice, and choose the one that really goes to you (nobody will kill you if you prefer licenced themes, and I don't have a problem with that eighter. So, which do you prefer in general? Or which you have more sets from? I know how much criticism I may get, but literally the only original themes I like on par with licensed are HeroFactory and Bionicle. There are ones I still like (Ninjago, Power Miners, Space Police III), but they still have got nothing on Overwatch and Marvel. latin music plays Why not both? Seriously though, there's so much variety to both that I can't really say I "prefer" either. I spent just as much of my childhood rabidly collecting Lego Star Wars as I did Bionicle, and it's not like one or the other gave me a more authentic Lego experience. It really just comes down to the individual theme. @ToaNoah_Wafflemeister I respect your opinion, but here is what I think. First off, to clarify the situation, I don't hate licensed themes. I just think that they started to lead the LEGO market, instead of Original Themes leading. 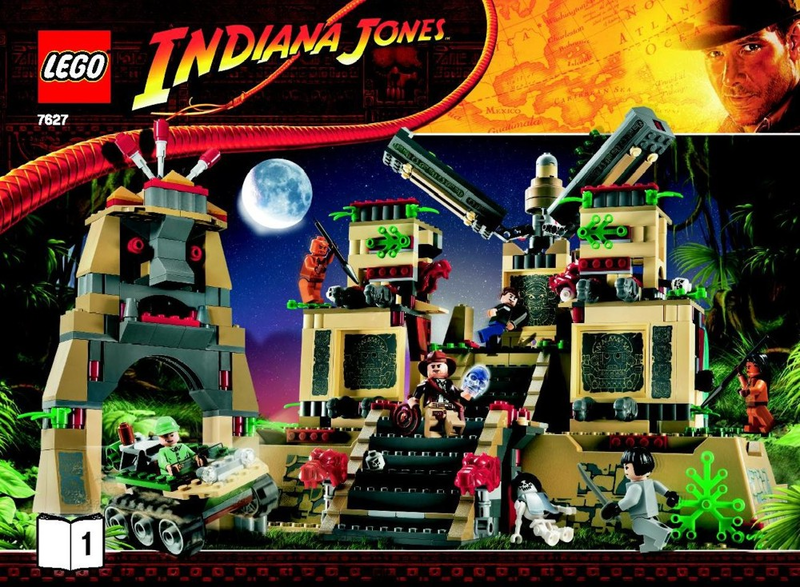 While I don't care about most licensed themes, The only one I really liked is probably Indiana Jones (I like LEGO Pirates of the Caribbean too, but most sets were just made to promote the On Stranger Tides movie, which I absolutely hate). While I admit that I would like some licensed themes back, I don't like most of the ones that are now (Star Wars and Harry Potter). 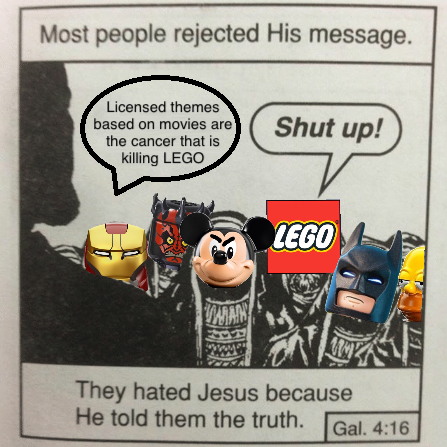 At the end of the day, while I do like some licensed themes,most of them are just not my thing, and if they will lead the LEGO market in the feature more original themes, the worse for me. With original themes on the other hand, there is none which I can admit that I did't liked. Even Nexo Knights wasn't anything bad to me, I actually quite liked the idea. And I would absolutely have a theme like Nexo Knights more then Harry Potter. (You said you don't like Herry Potter yourself). But that is just my opinion, though. @jayzor17 while they both give you the "LEGO" experience, I feel like original themes have a lot more creativity put in them. Just think how carzy ideas must come to you to invent such things like Bionicle. With licensed themes on the other hand, It's just a representation of a scene from a movie. That does not any real creativity put into it, IMO. I like licensed because it's usually familiar to me, something that I know. Plus they usually give me fleshy faces and hands, which I prefer over yellow.the faces usually have more detail, as well. I can understand this, even if I don’t agree. I guess I just really enjoy stories, and I love “owning” part of those stories. I love Bionicle because of its vast, amazing, and interesting story that never gets old. Because of this, I want to “own” a part of that story. I never really felt Nexo Knights’ story, I wasn’t the target demographic anyways. I love Overwatch because of vast characters and abilities. On top of how much fun I have in the game, I also love the lore, and learning about my favorite characters is awesome. And so, I was very elated when I heard the news of LEGO Overwatch. Despite the lacking of my favorite character in any of the sets, I will be buying Reinhardt and D.Va because I like those stories and I love to play the latter. At the end of the day, I’d rather have a Hulkbuster set on my shelf than a Knight Mech, simply because I know and love the story behind it. I like the Harry Potter sets, but, because I don’t like Harry Potter all too much, I won’t be buying any. Besides, I have a few highlights from the last wave (if I didn’t already have the Knight Bus, I’d probably buy it if they made another). While I understand what you mean, I feel like the original themes have a lot more creativity put into them. Tons of other toys are produced after a movie, makeing LEGO feel unoriginal. But with original themes, there is nowhere anything like it . Take Nexo Knights, for example. While is not the best theme ever, just look at the concept: How Knights will fit into a modern-day setting. While they have medieval style vehicles, they also have modern robots, and such. Where have you seen anything similar? I tell you: Nowhere! That is what made LEGO so unique and interesting. Those crazy concepts that none have though of before. With licensed themes.... You get the point. Nowhere? That idea has been around in many different places. At least none that would sell at a toy brand, as far as I am aware. Licensed theme are always nice, and can provide an opportunity to get a quality/affordable toy for a series/franchise where it would not otherwise be an option. A good example would be the Lego Voltron set. But original themes will always be better simply because of what has to go into them. In all seriousness I don't hate licensed themes, or at least not as much as most people I talk with, but they are rather dull. Also we're in desperate need of a proper space theme. We sure are. But Instead, LEGO gives us OverWatch. Let's be honest. I know some people here really like this sets, but who has EVER asked for LEGO OverWatch? Maybe Fortnite was a higher posibility since it's the most popular game of 2018. But OverWatch? Really? It was bearly popular 2 years ago (2016). And I would not be surprised if the supposed "replacement" theme for Nexo Knights is confirmed to be actually OverWatch. (Or that weird FORMA theme that was absolutely unnecessary). Licensed Themes are good, but LEGO needs more original themes. The only reason I never did is because I thought my dream was too good to be true. I also don’t think people would spend $30+ on custom Overwatch minifigures if they didn’t want it to happen. who has EVER asked for LEGO OverWatch? Have you seen how excited the TTV cast are about this? I'm pretty out of the loop in a lot of circles, but Lego Overwatch seems relatively popular from what I've seen. You may not be one of those people, but there are plenty of people out there who are enjoying this. Then I am happy that your dream came true. My dream is to have a theme like Racers back, but back in it's authentic form, not a lazy reboot like G2. Now if this come true, I'l buy all available sets in the first day they realise. And a tone of other people claim to be LEGO fans and are actually just fans of LEGO Star Wars. Even though recently has been a wake up to remind the people of the true LEGO, such as Nick on Plant Ripple, those YouTubers are small, and irrelevant for the most part. I hope you understand what I am trying to say. Licensed Themes, especially Star Wars and Harry Potter, are WAY TO OVERRATED. Licensed Themes, especially Star Wars and Harry Potter, are WAY TO OVERRATED. If they sell well then Lego's gonna keep making them. Deja fu, I feel like I've seen this topic before. To be honest, I don't care of original themes anymore. Like, at all. With the exception of Bionicle (because yes) and Hero Factory (because nostalgia) I haven't checked the other original themes for a long time. One of the strongest examples is that I stopped watching Ninjago. You can criticize me, but I don't really care of Ninjago anymore. For me it is just a animated cartoon that still tries to make new seasons to sell toys. However, I actually care about the franchises behind the licensed themes: Marvel, Star Wars, a little bit of DC, etc. I will always look forward for the new sets, especially because they are selled before the movie is reliesed and who knows? Maybe we get more informations about the movies! Spoilers often make movies less enjoyable, this is why you always see that spoiler alert in videos. I was in a camp this summer, and all my friends talked about Infinity War, spoiling me everything. And when I watched the movie... I didn't enjoy it that much as other 2018 movies. I wasn't even into lego at that time. I am referring at the modern sets. The Infinity War sets came out before the movie, and they were pretty accurate.